1. Buy Crypto Defender® through our web site. If you have already purchased Crypto Defender® and received your email, please skip to step number 3. If you have successfully installed the product and just need to activate please skip to step number 4. 2. Shortly after your purchase you will receive an email from "Order Information - element 5" (notification-eng@element5.com). It is very important to keep this email for your records! Included in this email will be your License Key as well as a link to download the client and your User ID. 3. Once downloaded simply follow the instructions. It is highly recommended that you save all your work and close all other programs before installing. The installation will close Internet Explorer for you, but you must manually exit if you are using Firefox, The installation requires you to reboot upon completion. 4. After you reboot and sign back onto your computer, you might see a command prompt window. This is the installation finishing. Once Windows finishes loading up, GuardedID® will launch a "Successful Installation" web page in Internet Explorer. If for some reason this does not happen, HELP can be found in Start | All_Programs | Crypto Defender® | Crypto Defender® Help. In Windows 8, you go to the Desktop | Crypto Defender® Help. 5. To activate your product, have your License Key available. In Version 3 simply launch Internet Explorer (if it is not already opened) and you should see the Crypto Defender® toolbar. If you do not see it, right-mouse click underneath the address bar and click on "Crypto Defender®"and see the Manage on top. If Crypto Defender® Version 4, go to the Crypto Defender® Icon on the bottom right and right click on the G to go to the Manage License drop down. If Crypto Defender® is not an option, press the red X of the "Successful Installation" page. If the additional instructions do not help, head over to either the Troubleshooting, Support Bulletin Board FAQ or email us at support@cyberidguard.com for help. 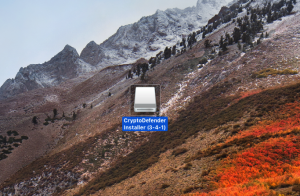 Once you see the Crypto Defender® toolbar, please move on to the next step. 6. Click on the gray “Activate” in the Crypto Defender® screen and enter your personal information on the screen for Version 3. If Version 4, please enter your name and address and License key in the fields of the bottom right ‘C’, Manage License drop down. For both Versions no need to worry about keyloggers. Even though Crypto Defender® is not fully activated yet, it is active for this window. You will notice a Machine ID value. That is automatically generated based on your specific computer. If you ever need to change any information you enter into this form, you can always do so at a later point in time. Be sure to correctly enter your User ID and License Key. 7. Once completed, press Activate. If all of your information was correct, you will now be able to use Crypto Defender®. If not, it will let you know something was wrong. 8. If you ever need to go back to change any of your user information once you have activated Crypto Defender®, on the Crypto Defender® toolbar click on Manage and select “Mange license” for Version 3. For Version 4, if you activated Crypto Defender®, on the Crypto Defender® bottom right Icon right click on the G and hit Manage License. This allows you to Deactivate Crypto Defender® as well as update other personal information. 9. You have now successfully installed and activated Crypto Defender®. CONGRATULATIONS!! Click on the green arrow to download Crypto Defender® to your computer. After the download, click on Show in Finder, and locate gidsetup-en.dmg. Note: The download may appear differently depending on the Mac OSX version installed in your computer. After you have located the file, double click on it to open. 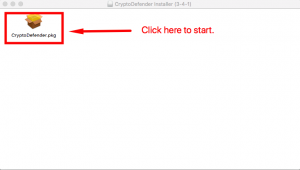 The Crypto Defender® Installer dialog box will open. Double click on CryptoDefender.pkg. 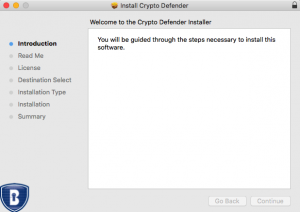 The Crypto Defender® Installer will guide you through a series of steps beginning with the Introduction. Read Me contains information that is important if Crypto Defender® is already installed. Read the Software License Agreement and continue. Select an Installation Destination and Type, then install. 1. An email has been sent with the activation link. 2. Open the email in the mobile device you wish to protect and click the link. 4. Enter your email in the second field for verification. 5. Create an account by picking a password and putting your email into the third box. Create a unique Profile Name in the third box. Make sure to write down your email, profile name and password for this account. 6. Download the Apple or Android CryptoDefender App and install. 7. Login with your CryptoDefender email and password. Allow permissions to switch to the secure keyboard and browser. NOT in the CryptoDefender settings. 1. Go to Settings > Language & input. 3. Under Keyboard & Input Methods, click on Default. 4. A "Choose input method" screen will pop open. Choose "MobileTrust"
5. Click on Set up input methods. 6. Exit the setting and go to your internet browser or text messaging. 7. Engage the keyboard as you normally would. This General Information section explains the CryptoDefender® technology, how it is used, and the purpose for which it is intended. CryptoDefender® is an application for mobile devices, such as compatible Android devices, which improves operational security in a multitude of ways. CryptoDefender® can launch a securely encrypted mobile browser, a password vault for securely storing any number of login credentials for websites, a one time password (OTP) engine, and a customizable secure password generator. The CryptoDefender® app utilizes a system-wide encrypted keyboard which fortifies operational system security both inside and outside of the CryptoDefender® app. The CryptoDefender® app is compatible with Android devices running Android 4.0 (and higher versions). Internet connection is required for certain CryptoDefender® features to function properly, such as its secure encrypted mobile browser. Only registered users can use this application to add, change, and/or delete data to and from its database. This Getting Started section explains how to install the CryptoDefender® app on a compatible Android device. Users can find the CryptoDefender® app by searching "CryptoDefender" in the Play Store for Android devices. For information regarding how to install an app on a compatible Android device, refer to the specific device’s user guide. Note- In order to access the CryptoDefender® app and its features, you must have active login credentials with an up to date software license. Tap the blue "SET UP KEYBOARD" button which will automatically display the Android system settings menu in which you must enable the MobileTrust® Secure Keyboard as seen below. If your device asks you for permission to allow this change, you must grant permission to continue. Once you have enabled the CryptoDefender Secure Keyboard, you must return to the CryptoDefender app then tap the "DONE" button to continue. Note- The CryptoDefender® app will check for an updated license profile every 48 hours until the selected license expires. If your license has expired, you must renew your license with the appropriate vendor. If the currently used license profile has an expired license, the MobileTrust® app will automatically select a different license profile if one exists with an up-to-date license. In order to properly utilize CryptoDefender® encrypted keyboard, users must enable the CryptoDefender® secure keyboard in their Android device system settings. Performing this step will result in the CryptoDefender® encrypted keyboard becoming accessible for use both inside and outside of the CryptoDefender® app. Open system settings and scroll down to "Language and input". Tap "Language and input". Note: On certain Android 7.0 systems, the "Language and input" option may be located within "General management". In the menu "Language and input" menu, tap "Default Keyboard" and then tap "Set Up Input Methods" if the "English (United States) CryptoDefender" setting is not available. Note: On certain Android 7.0 devices, this option may be configured by tapping "Virtual Keyboard" then tapping "Manage keyboards". In the "Set Up Input Methods" menu or the "Manage keyboards" menu, use the toggle switch to enable the "CryptoDefender" keyboard, then you may set the "CryptoDefender" keyboard as the default system keyboard in the previous menu. The following image is the main menu of the CryptoDefender app. This menu gives you easy access to all of CryptoDefender’s functions. You may tap the "i" info icon to access more information about each of CryptoDefender’s® functions. The CryptoDefender® Secure Keyboard is designed to actively encrypt every keystroke you type with it. The following image shows the CryptoDefender® Secure Keyboard "Light" theme. 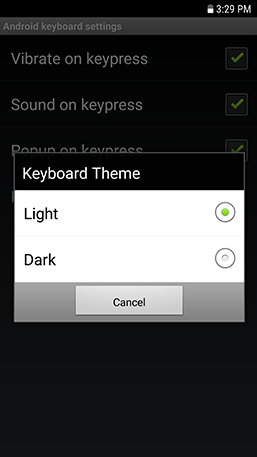 In the "Android keyboard settings" window, you can toggle options such as "vibrate on keypress", "sound on keypress", "popup on keypress", as well as select a "Dark" theme from the "Keyboard Theme" selection window. Tapping the "‹" icon will navigate to the previously loaded page. Tapping the "›" icon will navigate to the next page. 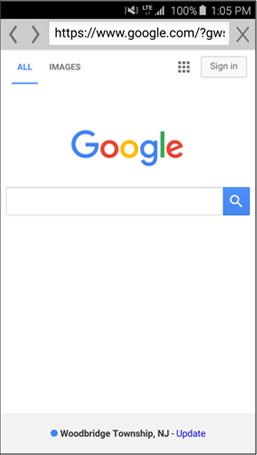 Tapping the "X" icon will close the secure browser. Description: A description of the website/service that the Password Vault is storing credentials for. Username: Login username for a website. Password: Password associated with the login name. URL: A link to the website which allows the CryptoDefender® app to automatically launch it for you using the bundled Secure Browser. The following image is a sample empty Password Vault. To add a new entry, you may tap the "Add new password" text or the "+" icon. Once login credentials have been saved in CryptoDefender’s® Password Vault, you may view the saved login credentials by tapping the description, which was entered during creation of the password, in the main Password Vault menu. Doing so will display the following window with login credentials, the ability to hide/show the saved password, and a "Launch the Web Page" link which launches the specific website using the bundled Secure Browser. CryptoDefender’s® One-Time Password Generator is based on "Open ID". Open ID is a widely used open protocol standard that enabled users to authenticate themselves in a decentralized manner and does not rely on a central authority to authenticate a user's identity. Open ID enables users to consolidate their digital identities. Users may create accounts with their preferred Open ID identity providers, and then use those accounts as the basis for signing on to any website which accepts Open ID authentication. The following image is CryptoDefender's® homepage for One-Time Passwords. The user is able to choose between "Add new OATH OTP" and "Add new ProtectID OTP". Using Key URL: User must input the key URL in the corresponding field and then click on the Register button. Scan Barcode: User must use their Android device camera to scan their barcode then click on the register button. Manually Add Account: Users can also add accounts manually by inputting a username, a secret code, choosing a method, and setting a counter in the corresponding fields and then clicking on the Register button. In this Add New ProtectID OTP section, users can register themselves by filling in the Username, Password, Company, PIN, Phone, and Method fields with the appropriate information/choice. The user may then begin the registration process by tapping the "Register" button. After inputting the necessary information and tapping the "Register" button, the app will call the Web method with the inputted username, password, company, PIN, phone number, ticket, locale, and device ID. Upon successful execution on the web method, the app will return a URL corresponding to a specific customer. Using this URL, a separate web method is called. This web method validates the unique User ID and Device ID, registers the data in the server, and returns back a Device PIN. Password Length: Allows you to specify the length of your generated password (Up to 99 characters). Lower Case:Toggles whether or not lower case letters will be included in the generated strong password. Upper Case: Toggles whether or not upper case letters will be included in the generated strong password. Numbers: Toggles whether or not numbers will be included in the generated strong password. Non Alphanumeric: Toggles whether or not characters other than letters and numbers will be included in the generated strong password. Starts With Number: Toggles whether or not the generated strong password will start with a number or a letter. Starts With Letter: Toggles whether or not the generated strong password will start with a letter or number. Stay Logged In: Toggles whether or not you will have to sign in to the CryptoDefender® app with your email and password upon each launch. Show Secure Keyboard Reminder: Allows the user to set whether or not they will receive a reminder to enable the CryptoDefender® Secure Keyboard every time they launch the CryptoDefender® app. Turn Fingerprint Verification On/Off for Password Vault: Allows the user to set whether or not their fingerprint will be required to access the Password Vault feature on compatible Android devices with currently registered fingerprint(s). Turn Fingerprint Verification On/Off for One-Time Passwords: Allows the user to set whether or not their fingerprint will be required to access the One-Time Passwords feature on compatible Android devices with currently registered fingerprint(s). Secure Browser Homepage: Allows the user to set a custom homepage for the CryptoDefender® Secure Browser. Backup My Data: Allows the user to back up his/her data within an encrypted zip container located at (/sdcard/mobiletrust/archive.zip) for Android devices. Restore My Data: Allows the user to restore his/her data. Version: Displays the currently installed version of CryptoDefender®. Cannot be modified. Machine ID: Displays an ID unique to your device. Cannot be modified. Connect your mobile device to your PC/Mac. Open your mobile device's SD card. Navigate into the MobileTrust folder. Copy "archive.zip " to your PC/Mac. Runs in a sandbox environment. Clears cookie & session caches upon launch. Does not allow potentially malicious and/or vulnerable browser extensions which mitigates the likelihood of man-in-the-browser attacks. Does not allow potentially malicious and/or vulnerable simultaneous tabs which mitigates the likelihood of cross-site request forgery (CSRF) and tabnapping attacks. Password Length: Determines how many characters, in terms of length, the generated password will be. Lower Case: Toggles whether or not the generated password will include lower case letters. Upper Case: Toggles whether or not the generated password will include upper case letters. Numbers: Toggles whether or not the generated password will include numbers. Non Alphanumeric: Toggles whether or not the generated password will include characters other than numbers and letters. Having a difficult-to-guess password is crucial in protecting your online account login credentials. Using CryptoDefender’s® password generator will allow you to easily store the generated password directly into CryptoDefender’s® Password Vault. Description: In this text field, enter a description of the website/service for which you would like to save the login credentials. Username: In this text field, enter the username associated with the account for which you would like to save your login credentials. Password: In this text field, enter the password associated with the account for which you would like to save your login credentials. URL: In this text field, enter the URL of the website for which you would like to save your login credentials. An example of a URL would be "www.google.com" without the quotation marks. Add custom field: In this optional text field, you may elect to enter additional notes which expand upon your to-be saved login credentials. Once you have multiple passwords saved, you may search through your saved passwords with the search bar at the top of the Password Vault menu. CryptoDefender’s® One-Time Password (OTP) Generator allows you to generate both ProtectID and OATH based one-time passwords for two-factor authentication purposes. CryptoDefender® is an application for mobile devices, such as compatible iOS devices, which improves operational security in a multitude of ways. CryptoDefender® can launch a secured mobile browser, a password vault for securely storing any number of login credentials for websites, a one-time password (OTP) engine, and a customizable secure password generator. The CryptoDefender® app utilizes a system-wide encrypted keyboard which fortifies operational system security both inside and outside of the CryptoDefender® app. The CryptoDefender® app is compatible with iOS devices running iOS 11.0 (and higher versions). Internet connection is required for certain CryptoDefender® features to function properly, such as its secure encrypted mobile browser. This Getting Started section explains how to install the CryptoDefender® app on a compatible iOS device. Users can find the CryptoDefender® app by searching "CryptoDefender" in the App Store for iOS devices. For information regarding how to install an app on a compatible iOS device, refer to the specific device's user guide. After installing the CryptoDefender® app, you will be greeted with the following splash screen when opening the app. Note- The CryptoDefender® app will check for an updated license profile every 48 hours until the selected license expires. If your license has expired, you must renew your license with the appropriate vendor. If the currently used license profile has an expired license, the CryptoDefender® app will automatically select a different license profile if one exists with an up-to-date license. In order to properly utilize CryptoDefender's® encrypted keyboard, users must enable the CryptoDefender® keyboard in the iOS system settings. Performing this step will allow you to use the CryptoDefender® encrypted keyboard both inside and outside of the CryptoDefender® app. To enable the CryptoDefender secure encrypted keyboard, tap the "CryptoDefender" text. The following image is the main menu of the CryptoDefender app. This menu gives you easy access to all of CryptoDefender's functions. You may tap the "i" info icon to access more information about each of CryptoDefender's® functions. The CryptoDefender® Secure Keyboard is designed to actively encrypt every keystroke you type with it. The following image shows the CryptoDefender® Secure Keyboard being used in the CryptoDefender® Secure Browser. It is important to note that, if at any point, you would like to switch to different keyboard on your iOS device, you may do so by tapping the "Globe" icon to the left of the space bar. Tapping the "<" icon will navigate to the previously loaded page. Tapping the ">" icon will navigate to the next page. Tapping the "Done" button will close the secure browser. Website name: Name/Description of the website that the Password Vault is storing credentials for. Once login credentials have been saved in CryptoDefender's® Password Vault, you may view the saved login credentials by tapping the Description, which was entered during creation of the password, in the main Password Vault menu. Doing so will display the following sample window with your saved login credentials, the ability to hide/show the saved password, and a "Launch the Web Page" link which launches the specific website using the bundled Secure Browser. CryptoDefender's® One-Time Password Generator is based the OATH standard. The following image is MobileTrust's® homepage for One-Time Passwords. The user is able to choose between "Add new OATH OTP" and "Add new ProtectID OTP". Scan Barcode: User must use their iOS device camera to scan their barcode then click on the register button. Lower Case: Toggles whether or not lower case letters will be included in the generated strong password. Non Alphanumeric: Toggles whether or not characters other than letters and numbers, such as "<", will be included in the generated strong password. Show Secure Keyboard Reminder: Toggles whether or not the app will display notifications to remind you to enable the CryptoDefender® Secure Keyboard. Turn Fingerprint Verification On/Off for Password Vault: Enables/disables Touch ID verification as a requirement for accessing the Password Vault section. Turn Fingerprint Verification On/Off for One-Time Passwords: Enables/disables Touch ID verification as a requirement for accessing the One-Time Passwords section. Keyboard Setting: Brings up a menu to customize some features of the CryptoDefender® Secure Keyboard. Backup My Data: Allows the user to back up his/her data within an encrypted zip container. See detailed backup instructions below. Click on the connected device icon. Scroll down to find the "File Sharing" option. Click on the MobileTrust app which will take you to the document directory of the application. Copy "archive.zip" to your PC/Mac. Non Alphanumeric: Toggles whether or not the generated password will include characters other than numbers and letter such as the ">" character. Starts with Number: Toggles whether or not the generated password will begin with a number as opposed to a letter. Starts with Letter: Toggles whether or not the generated password will begin with a letter as opposed to a number. Having a difficult-to-guess password is crucial in protecting your online account login credentials. Using CryptoDefender's® password generator will allow you to easily store the generated password directly into CryptoDefender's® Password Vault. Website Name: In this text field, enter a description of the website for which you would like to save the login credentials. Once you have multiple passwords saved, you may search through your saved passwords with the search bar at the top of the main Password Vault menu. CryptoDefender's® One-Time Password (OTP) Generator allows you to generate both ProtectID and OATH based one-time passwords for two-factor authentication purposes. What are the existing methods for detecting keyloggers? The existing methods for detecting keyloggers fall into one of two categories -- (1) Scanning for known keyloggers, and (2) Trying to prevent the keyloggers from hooking into the Windows message stream. Neither method is foolproof, since new keyloggers cannot be detected with the first method and it is difficult to stop keyloggers from hooking into the Windows message stream. CryptoDefender® is a software program which encrypts your keystrokes between the keyboard and your desktop applications and Internet browsers, so that keyloggers cannot steal your personal or financial information. CryptoDefender® Edition works with Internet Explorer and Firefox to block keyloggers from grabbing information going to Internet applications and protection for desktop applications like Office, email, accounting, messaging, etc. CryptoDefender® Enterprise Edition packages the Premium Edition solution with central management, vendor support, and multi-seat licensing. What is "Screen-scraping" (aka "Screen Logging")? Does CryptoDefender® Protect me? CryptoDefender® Premium Version "Desktop Protection" includes a blocker to hide the screen from screen loggers. "Screen-scraping" loggers capture snapshots of your screen each time you make a change. If my computer is infected with a keylogger, will CryptoDefender® protect me? Yes. CryptoDefender® will protect the keys you type inside your browser, even if your anti-malware programs do not have current signatures. When the CryptoDefender® light is Green and says "ON" (or the "B" in the SysTray is flashes as you type), CryptoDefender® is protecting your keystrokes from keyloggers. What Internet Browsers are supported by CryptoDefender®? CryptoDefender® Premium (also Enterprise) works with all major browsers. CryptoDefender® provides additional protection for the most popular browsers by installing a toolbar. The CryptoDefender® toolbars are provided for Internet Explorer 9 on and Firefox releases from 29 on (CryptoDefender is usually available within days of a new Firefox release). Note - If you choose to install Firefox after you have already installed CryptoDefender® you must re-run the CryptoDefender® installer. What versions of Windows does CryptoDefender® work with? CryptoDefender® works with all versions of Windows 10 or newer and Server 2012r2 or newer. Will CryptoDefender® work with any keyboard? CryptoDefender® works with PS/2 keyboards as well as USB keyboards, including wireless keyboards. Certain enhancement drivers for advanced specialty keyboards may not function when CryptoDefender® is enabled. Does CryptoDefender® protect a USB keyboard plugged into my laptop? CryptoDefender®protects typing from all active keyboards; the laptop keyboard and/or USB keyboard and/or PS/2 keyboard. Does CryptoDefender® hide my keystrokes when I am using Remote Desktop programs? Yes. The keystrokes going to Remote Desktop Connection programs can be hidden by the current CryptoDefender® releases. 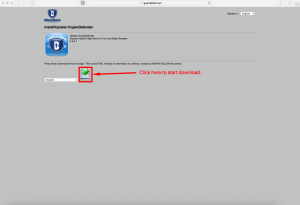 What is the difference between CryptoDefender® and other anti-keyloggers? CryptoDefender® takes a unique approach to snoop protection. It encrypts all keystrokes and transfers them to the browser via a proprietary path, bypassing the Windows message stream completely. Thus existing and new keyloggers can't get their hands on the keystrokes.